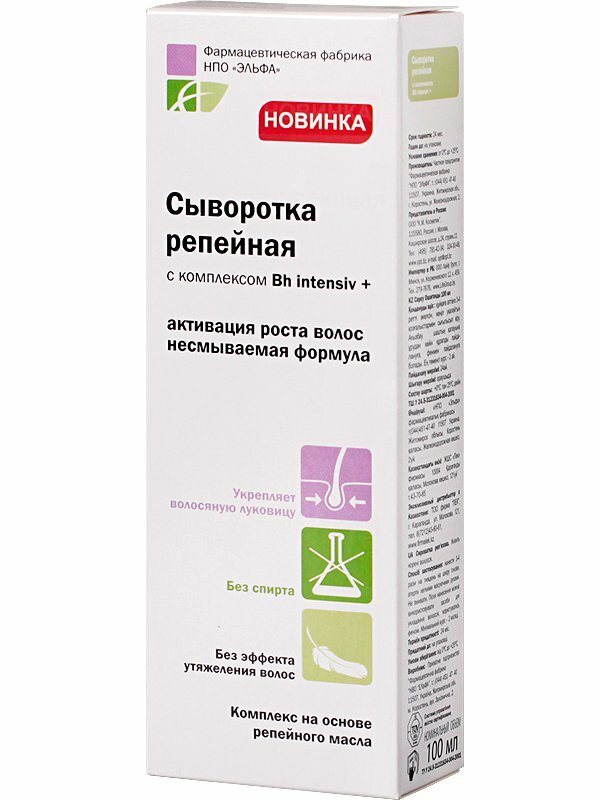 Burdock Hair Serum is produced by the Ukrainian beauty brand Elfa Pharm. The product is formulated with the Bh intensiv+ complex and growth activator. It is a leave-in product that strengthens hair follicles, prevents hair loss, stimulates hair growth, and actively repairs damaged hair structure. Alcofol-free. Doesn't weigh the hair down. Like other products from Elpha Pharm's burdock line, the serum contains burdock root macerate, commonly known as burdock oil, as one of its key ingredients. Burdock oil is obtained from the roots of greater burdock (Arctium lappa). It is known for its high content of vitamins and the ability to prevent hair loss. The product is enriched with nettle extract, avocado oil, rosemary oil, thyme oil, and other natural ingredients. When used regularly, Burdock Hair Serum stops excessive hair loss and stimulates the growth of new hair. It helps to repair damaged hair structure, improves hair elasticity and flexibility, and makes the hair thicker, smoother, stronger and shinier. Action mechanism. Burdock Hair Serum contains Bh intensiv+, a unique active complex that stimulates microcirculation in the scalp and thus helps to provide hair follicles with nutrients. It activates and prolongs the growth phase of the hair growth cycle, also known as the anagen phase, stimulates keratin synthesis, repairs damaged hair structure, regulates sebum secretion, relieves irritated, itchy and flaky scalp. Direction. Spray onto scalp and rub in with light strokes. Do not rinse off. Use 3 or 4 times a week for at least 2 months. Ingredients. Aqua, Urtica Dioica (Nettle) Extract, Lupinus Angustifolius (Lupine) Peptide, Hydrolyzed Keratin, Polysorbate 20, Equisetum Arvense Extract, Ruscus Aculeatus Root Extract, Niаcinamide, Polysorbate 80, Serenoa Serrulata Fruit Extract, Trifolium Pratense Flower Extract, Angelica Archangelica Root Extract, D-Panthenol, Hydrolized Soy Protein, Propylene Glycol, Medicago Sativa Leaf Extract, Polygonum Multiflorum Root Extract, Centella Asiatica Leaf Extract, Ligusticum Chuanxiong Root Extract, Persea Gratissima (Avocado) Oil, Diazolidinyl Urea, Methylisothiazolinone, Citric Acid, SC-СО2-extract Arctium Lappa (Burdock), Rosmarinus Officinalis (Rosemary) Essential Oil, Methylparaben, Thymus Vulgaris (Thyme) Essential Oil, Propylparaben. Want to buy Burdock Hair Serum? Call us or submit your order via our web site! Elfa Pharm is a cosmetic brand owned by the Ukrainian-Polish group of companies Elfa. The brand's burdock series consists of intensive hair care products designed to cope with the problem of excessive hair loss. All the products are formulated with natural burdock oil and/or extract. Elfa Pharm hair products are manufactured in Poland and exported to different countries. All products in Elfa Pharm's burdock series contain the Bh Intensiv+ active complex. Due to this innovative ingredient, Elfa shampoos, conditioners, masks, serums and oils provide hair follicles and scalp with nutrients, stimulate hair growth and prevent premature hair loss. They help to repair weak and brittle hair damaged by blow-drying, hot styling, dyeing, bleaching. With regular use, your hair will become stronger, softer and shinier. Elfa Pharm hair care products do not contain alcohol or SLS/SLES. Thus, they do not dry your scalp and do not cause irritation, itching, flaking or dandruff. Each product contains natural burdock oil which has been used in some countries as an effective hair loss remedy for decades. Elfa's hair care products that belong to the burdock series are suitable for all hair types. They are enriched with natural extracts and oils that help to keep your hair fresh and clean, protect it from harmful environmental factors and restore its natural health and beauty.